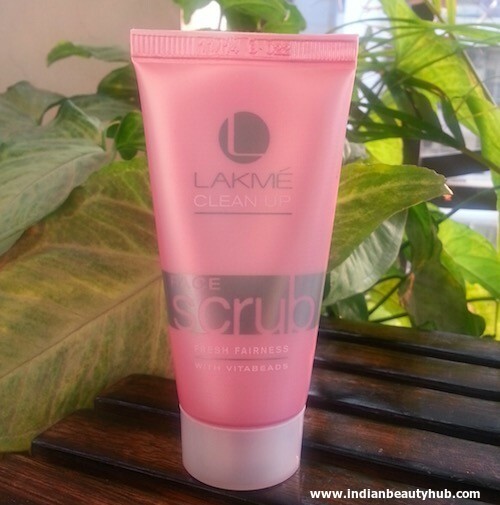 Hey everyone, today I’m going to review the Lakme Clean Up Scrub Fresh Fairness. 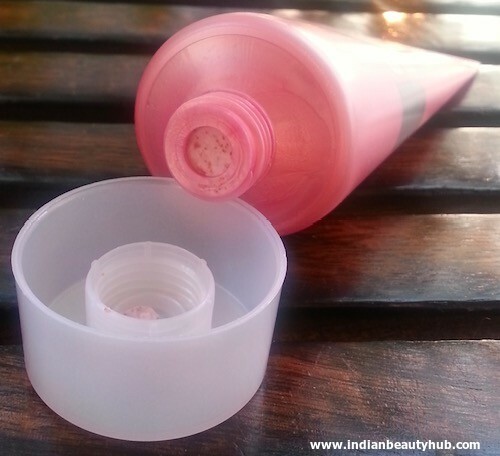 You can also check the review of Lakme Clean Up Scrub Clear Pores which is my HG face scrub. The face scrub comes in an easy to use squeeze tube with a screw cap. The packaging is sturdy, hygienic and travel friendly. All the required product information like its claims, how to use, ingredients, expiry date, etc. is given on the pack (the white content on the pink tube is a little difficult to read though). This cream based face scrub comes in a light pink color and contains a lots of brown scrubbing granules along with a few strawberry seeds. It has an artificial fruity fragrance which is not very strong though. 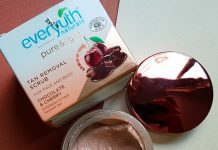 Before using this scrub, I generally moisten my face by splashing warm water. Next I take a generous amount of the scrub and massage it gently all over my wet face & neck avoiding area around my eyes. I mainly focus on my t-zone (nose, forehead, chin) which is more prone to blackheads and whiteheads. I usually massage it for 3-4 minutes and wash it off with normal tap water. It exfoliates the skin very well and is very effective in removing dirt from pores and extracting whiteheads and blackheads. After every use my skin feels soft & smooth and there is a visible glow on my skin which lasts for a few hours. I have acne prone oily skin and it never caused any skin breakouts (but make sure to not use it on breakouts). It is suitable for almost all skin types except very sensitive skin. Use this face scrub twice a week to keep the skin blackheads and whiteheads free. The quantity provided for its price is pretty decent. This 50g tube will easily last up to 25-30 usages. It is easily available at local stores and leading online shopping websites. Not very effective in removing stubborn blackheads. People with sensitive skin might find it a little harsh on their skin. Lakme Clear Pores Face Scrub works much better than this one on my combination-oily skin. Claims : Your skin is currently shedding cells, which leads to a build-up of dead cell and dull-looking skin. Scrub your face with Lakme Clean-up Fresh Fairness Face Scrub that exfoliates dead cells and removes excess oil. 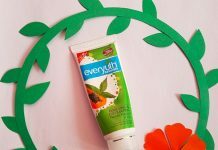 Enriched with Vitabeads, walnut shell powder and apricot extracts, it helps unclog pores, remove blackheads and restore your skin’s fairness. Ingredients : Aqua, Sodium Laureth Sulfate, Walnut Shell Powder, Cocoamidopropyl Betaine, Glycery Stearate, Propylene Glycol, Zea Mays (Corn) Kernel Meal, PEG 100 Stearate, Cetyl Alcohol, Ceteareth-20, Polysorbate-60, Acetylated Lanolin Alcohol, Titanium Dioxide, Perfume, Carbomer, Triethanolamine, Tocopheryl Acetate, Glycerin, Prunus Armeniaca (Apricot) Fruit Extract, Sodium Ascorbyl Phosphate, Niacinamide, CI 17200, PPG-2, Methyl Ether, Phenethyl Alcohol, DMDM, Hydantoin, Methylchloroisothiazolinone, Methylisothiazolinone. 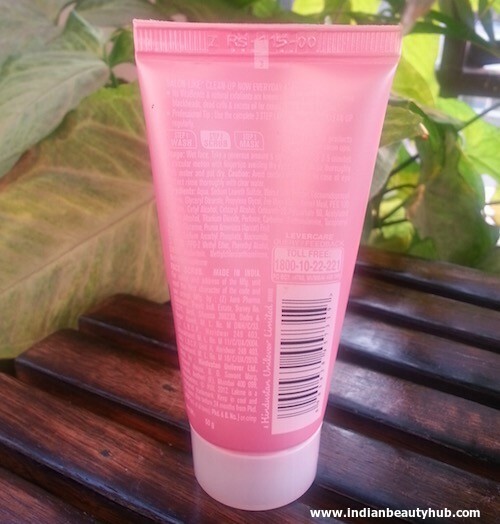 Lakme Clean Up Fresh Fairness face scrub does a pretty good job in exfoliating the skin. 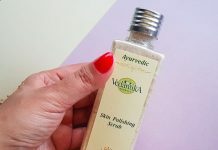 It removes dead skin cells and leaves the skin soft, smooth and refreshed. But still I find it an average face scrub without any additional benefits. Just an average products for me. its little harsh on my skin, clean and clear daily scrub is much better than this. yeah! Lakme clear pores one is much better than this one.